Whether you are hiking the Appalachian Trail, Pacific Crest Trail, Continental Divide, John Muir Trail, Mountains to Sea, or a lesser traveled trail, we can supply you with backpacking food. There are several methods hikers use for planning food resupply. Either way, it will require that you plan ahead of your hike. Place your order from our website as you are hiking and have it shipped to your resupply stop. You can create and store all of your shipping addresses ahead of time on our website. You will need to create a login to do this. When you are ready to place the order, you can select the shipping destination from your saved address list. Once you figure out your pace while hiking, it will get easier to gauge your resupply needs/stops to plan your orders. This method offers the most flexibility, and you will not be stuck with extra food if you don't finish your hike. You can place a single large order ahead of your hike and organize your resupply at home. Most hikers group items in separate pre-addressed boxes for each planned stop and have someone at home ship the boxes as needed. This requires the most amount of planning and expense upfront. It allows you to mix various items as needed, such as snacks and toiletries. Another option is to place individual orders ahead of your hike and have us hold your order and ship according to your schedule. Ordering ahead will require placing individual orders for each separate shipping destination along with your expected ETA (add this in the comments field when you place the order). We'll use your ETA to schedule your order, so it arrives at your destination when you need it. This works out well if 1) you do not have a reliable person to ship orders to you or 2) you do not live in the United States. Your food will be fresher since it is not sitting in storage. This also saves you more money on shipping since commercial rates offer you lower shipping. FREE GROUND SHIPPING is available for orders totaling $199 or more if delivered within the continental U.S. Orders will automatically be discounted during checkout. Please call or email if you need assistance with planning your food menu, or will be purchasing a large order on behalf of an outdoor organization, such as the Boy Scouts. Outdoor Herbivore has partnered with Trail Supply Co. to offer backpackers with a complete resupply service. Here you can plan and customize your resupply box to include more than just trail food. You can also add gear essentials, such as socks, cooking utensils, and toiletries while you are hiking. This is a fantastic option for international visitors and hikers that need maximum flexibility. Convenience: Plan and visualize your entire resupply strategy using their free resupply planning application. Build each box to your exact specifications, tell them when and where you want your boxes to arrive, and they handle the rest. This includes purchasing, packing, storing and shipping your resupply order. Flexibility: Edit your resupply while you are hiking. After you start hiking, you can log in to your account and change what is arriving in future resupply shipments as well as change when and where your boxes get shipped. Insurance: If you are unable to finish your hike for any reason, you can cancel future resupply shipments. Start planning your resupply strategy with Trail Supply Co.
Resupply points are continually changing as business' move, close, or no longer hold hiker boxes. Outdoor Herbivore does not maintain a list of resupply locations; however, we have compiled some excellent outside sources for this information. While these sites offer useful information, always reference the most recent guidebook for the most up-to-date information, and always check with businesses along the trail to ensure they are still open and accept package holds. Trail Supply Co offers complete resupply services for long-distance hikers and maintains an updated PCT Resupply Map. Halfmile’s PCT map website contains up-to-date maps, resupply options & notes along the PCT. He works with the Pacific Crest Trail Association (PCTA) to keep these maps up-to-date each year. Craig’s PCT Planner allows you to input daily mileage goals and choose resupply locations based on that. The most common resupply locations are loaded by default, and other options can be toggled on and off. Craig’s PCT Planner uses the Wilderness Press guidebook data for the trail. Planyourhike maintains mailing addresses and contact information for 101 PCT resupply locations. Postholer has maps of the various long distance trails and resupply points with extensive information on the PCT and Colorado Trail. Trail Supply Co offers complete resupply services for long-distance hikers and maintains an updated JMT Resupply Map. JMT.org maintains a list of places along the JMT that will hold your resupply packages. Several of these businesses charge a fee for the service. Trail Supply Co offers complete resupply services for long-distance hikers and maintains an updated AT Resupply Map. There are many online resources available to help you plan resupply points along the Appalachian Trail. 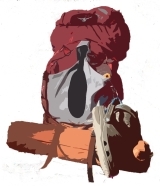 While AT focused, WhiteBlaze.net is an excellent resource for just about everything related to thru-hiking. For more information about how to send your order for package holds, or have it shipped to a thru-hiker, see shipping food to thru hikers. What can you expect from Outdoor Herbivore? Healthy, high-calorie meals. Our meals contain minimally processed fruits, vegetables, seeds, nuts, grains, and legumes to provide a carb-protein-fat combination that will deliver a sustained energy release so that you won't feel dull and sluggish. All ingredients are 100% vegetarian. No artificial ingredients. Most ingredients are organic. Gluten-free options are also available. Easy & Fast Meal Preparation. All ingredients are dried. Just add the packaging contents to boiling water or cold water to hydrate. All meals are ready to eat in 10 minutes or less. Varied Flavors – because everyone’s tastes are different. We use various spices and herbs to impart tasty, distinct flavors instead of the standard salt & pepper seasoning. Eco-Friendlier Packaging. Our packaging is not fancy. Our objective is to minimize plastic packaging and make it easier to pack inside a backpack. We use compact packaging to save on weight, waste, space, and cost. This packaging is not suited for adding boiling water and consuming from. You can purchase reusable heavy weight reclosable bags for this purpose, although we recommend using utensils and dishes instead. Light Weight. We've achieved incredible weight and size reduction by using a combination of high quality dehydrated and freeze-dried whole food ingredients. Once the food is soaked and/or cooked, the portions are 1-3X their dried size. You can find the meal weight listed on the product details page. Made by Backpackers. As vegetarian long distance backpackers, we understand the challenges in consuming enough calories to meet energy needs. Our meals are sure to satisfy your hunger and replenish your energy. Let us supply your meals for your next long distance hiking trip! If the thought of consuming processed rice and noodle meals, sugary snacks, energy bars, and other junk foods for the duration of your outdoor trip concerns you, then you have come to the right place. Outdoor Herbivore is your alternative to the commercial, chemically-processed trail foods. Each dish we offer is perfected on the trail, by long distance backpackers passionate about food, health, animal welfare, and the environment.